United Nations Secretary-General António Guterres and the UN mission in Afghanistan welcomed on Saturday the Afghan Government’s extension of the unilateral ceasefire with the Taliban, amid an outpouring of support for the truce from war-weary people all across the country. “The Secretary-General urges the Taliban to heed the call for peace from the Afghan people and also extend the ceasefire,” according to a statement issued by a UN spokesperson. Following an initial truce announced by both sides that was to run through the Eid-ul-Fitr festival period, which began this past Friday, Afghan President Ashraf Ghani on Saturday announced that the Government would extend indefinitely its ceasefire, which had been due to end on Tuesday. “[Mr. Guterres] believes that the only solution to the conflict in Afghanistan is through an inclusive political process,” said the UN spokesperson’s statement, adding that the world body stands ready to work with the Afghan people and Government, and all stakeholders to achieve lasting peace in the country. Reportedly, celebrations in support of the announcement continued in the country even as a deadly bombing in the eastern Afghan province of Nangahar targeting Eid celebrations claimed more than two dozen lives. That attack was reportedly carried out by the Islamic State of Iraq and the Levant (ISIL). Mr. Guterres extended his condolences to the families of the victims and wished those injured a swift recovery. 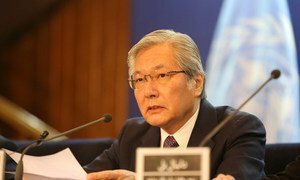 In a separate statement, Tadamichi Yamamoto, the top UN official in Afghanistan and head of the UN Assistance Mission there known as UNAMA, commended the Government and the Taliban for honoring the ceasefires. Mr. Yamamoto noted the outpouring support for the ceasefires and peace on the part of the Afghan people. “I have repeatedly stated that a negotiated settlement to the conflict is possible. Now I believe it can be imminent,” he stressed, calling for concrete steps to initiate direct talks between the Afghan Government and the Taliban.